I’m not sure about you, but September has always felt more like the beginning of a new year than January ever has. Perhaps because I’ve spent twenty years of my life as a student, but either way, once September rolls around I begin to think of back-to-school and learning. And, of course, when I’m here, I’m thinking about video games. So… why not both? For the most part, video games fall into two camps entertainment and educational. We are familiar with the “edutainment” games like Super Munchers and Mario Teaches Typing and the like, and familiar with the more “entertainment” games like the Assassin’s Creed games and Hellblade: Senua’s Sacrifice and other video games that one thinks of when thinking of, well, video games. Sometimes it seems like these games exist solely in two camps, and they seem to have built a huge wall with a moat in between them, happily existing in their own little worlds with their own ideas on what their audiences will get from them. If we’re talking about learning, that means that that it’s time for my favorite thing: definitions! What exactly is learning, and what are some of the processes involved in learning? Learning is a term applied to the acquisition of new or the modification of existing knowledge or behaviors, particularly ones that cannot be ascribed to general development. For instance, a baby doesn’t truly learn to hold its head up, as this is not knowledge or a way of behaving that will not develop naturally. To say that a different way, the baby doesn’t need to be shown how to do this; rather, normal physical development ensures that this milestone is met. However, learning to eye-gaze toward individuals when they are talking is a learned behavior, and vocabulary is learned knowledge. Regarding how humans learn**, there are fields of study dedicated to the intricacies of what actually happens in the brain, but for the purposes of this article learning occurs through the interaction between a person and their environment. Some might argue that this interaction but be done with intent, but as we have discussed, being exposed to stimuli can, in fact, cause permanent changes in how we think about things – aka, we learn through repeated exposure. But what about education? This is something we all are familiar with if we’ve ever been to a traditional school or learning environment. Education is generally understood to mean someone is given intellectual, social, or moral instruction by another person. The educator is the one who disseminates the information, and the educated is the one who absorbs the information. The one doing the learning often has a much more passive role. This is the model that most edutainment games adopt: the game is actively trying to convey information to the more “passive” learner. However, edutainment games try to tap into the very-important experiential part of learning by having the learner engage right away with the material. But let’s be real. 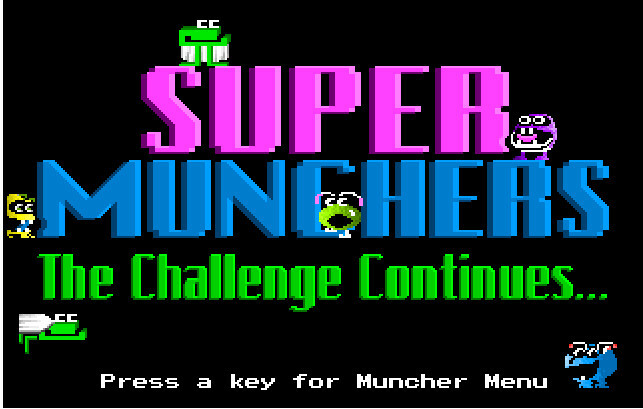 I was a fan of Super Munchers but I played it because I didn’t have many other PC games and because I really thought it would help me with mathematics. 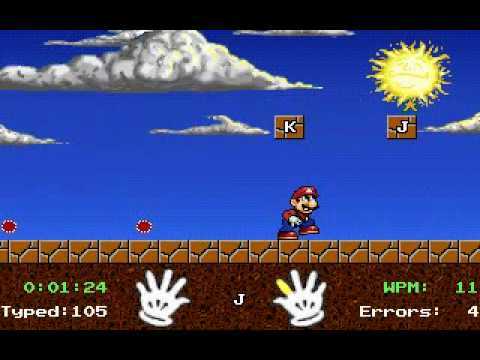 And as much as I loved Mario Teaches Typing, it wasn’t under Instant Messenger came along that I really learned how to type (and type well – I can type almost 90 words per minute accurately when I get going). Which is an interesting point. Caring about something in a personal way is much more motivating than being coerced into caring (e.g., wanting a good grade) or not caring about the topic at all (e.g., having to take a class because it is required for graduation). And as we know, games are pretty motivating, giving our brains exactly what they want, when they want it.They are engaging and motivating, and they have the amazing ability to draw people into a world so different from the physical world to the point where people speak Klingon, know official timelines and histories of fictional countries, and have a working understanding of complex political landscapes that have nothing to do with their own. Not quite reading, writing, and arithmetic, but it illustrates how compelling games can be. What I suggest is for games to facilitate learning, rather than do the teaching themselves. (This is not to harshly judge edutainment games, but rather is meant to present another way for games to facilitate learning). This could be done through something called tangential learning, which happens when someone is engaged in doing something, happens across something interesting, and then goes to find out more about that particular topic. An example I once heard was about the sephiroth. If just one or two percent of Final Fantasy 7 fans ever wondered where exactly Sephiroth got his name from, that is tens of thousands of people who learned about the sephirot tree. Maybe you wondered at the Masamune from Chrono Trigger and learned that Masamune was actually one of Japan’s most adept swordsmiths from the 13th century. Maybe while reading about Masamune, you clicked on a link to learn more about Murasama, who is referenced in the legend of Masamune. And so forth. But Athena, I hear you type. This is just clicking on links as you find things that are interesting. Well, yes. And learning things while you’re at it. I learned a lot about making swords as I researched Chrono Trigger’s masamune. Now imagine if a game curated this a bit more, sort of the way Dragon Age or Mass Effect games include codices. If it’s a PC game or connected to the internet, why not link to scholarly sites, or even a Wikipedia page? A game could include interesting names, places, concepts, and other topics that might interest a player, and then if they wanted to the player could explore at their leisure. If the links were to the internet, the player could then follow their interests from link to link. Sure, these loose examples don’t focus the person’s learning, and could result in a musician having a somewhat embarrassing knowledge of foods cooked in the 18th century, but I think there are some topics that lend themselves easily to this type of learning. Something that Assassin’s Creed has been doing for a long time, now. 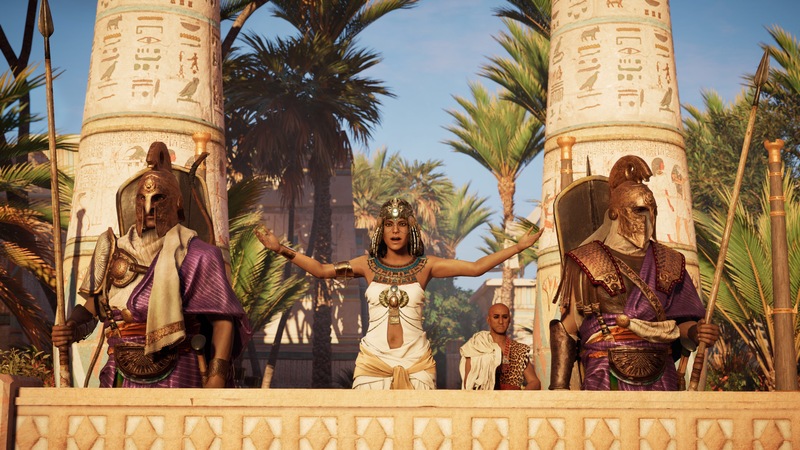 A few months ago, there was some buzz surrounding Ubisoft’s latest Assassin’s Creed game, Assassin’s Creed Origins. I have not really gotten into the Assassin’s Creed games, but this one caught my eye because I apparently enjoy games with the word “Origins” in the title it takes place in Ancient Egypt. Bonus points when Ubisoft added the Discovery Tour mode. I picked up a copy of this game on sale a few months ago, but it took a backseat to my Year of the RPG project. But the call of Egypt was strong and I popped it in and played around with it a bit to see what the fuss was about with the whole Discovery Tour mode. While the game itself provides little opportunity (so far) for tangential learning (or perhaps I’m not far enough along for the game to start dropping names and places yet), the Discovery Tour has been a lot of fun to go through. Each tour is pretty comprehensive considering they last between five and ten minutes each, but what is interesting is that while you are on the tour, it is possible to deviate from the path and do some free exploring before returning to the tour. For instance, while exploring the sphinx, the tour mentioned that some people believed there was a tomb inside it. Lo and behold, as I progressed through the tour I found a small hole in the back of the sphinx and was able to go inside and explore (and the game was kind enough to include a tomb, complete with mummy, to find). While learning about the Great Pyramid, I was able to scale it to the top and look at the stonework in detail. I walked through a pantomime of Cleopatra’s final days (and her palace), complete with in-game actress lying “dead” on the floor beside a topple goblet (although the actress kept scratching her chin, so….). So, yes, this was sort of, well, a guided tour, but you know what happened. I sat there saying to myself things like, “Huh, I did not know that about Cleopatra,” or “I wonder why the tip of the pyramid looks like that,” or “is this tomb based on a real person’s tomb?” And I went to find out the information. It started when I saw something interesting on the screen, or heard an interesting factoid on the tour, and continued when I took my learning into my own hands. This is not to say that “traditional” learning is wrong or bad. But I am saying that video games hold a unique place in many children’s/teen’s/adult’s lives today. The game didn’t make me feel stupid for not knowing something. It didn’t assume I knew things, and didn’t assume I didn’t know anything. It simply presented the information. It showed me something interesting, and then empowered me to go learn more if I so chose. Empowering people to learn is so important when it comes to education, and teaching people that learning can be fun is one of those lessons I think games can teach us. What do you think? Can education and entertainment exist in the same place at the same time? How could this be used in a classroom setting? Could it be used in a classroom setting? What is your favorite tangential learning memory? Let me know in the comments! I love the Chrono Trigger example because that is exactly how I learned about Masamune and Muramasa! I think I learnt more about world history and geography through Europa Universalis then History and Geography at school! The game is pretty historically accurate and shows more about the medieval world outside of Europe then school ever did. Not exactly sure if it would work in a school setting though? Shout out for FFVII hooray 🙂 I’ve been doing exhaustive research for an FFVII comparative essay I was hoping to complete during my two week vacation (not gonna happen), so I’d be quite the cranky old lady if someone attempted to say that games don’t teach us anything. I also spent a few hours writing about the Masamune and Murasame for a super secret project lol. So if research is any indication of learning/education then I’ve done a bit of back to schooling myself. I bought Assassin’s Creed Origins because I heard you could pet cats in the game. I only played for a half an hour due to the camera movements causing dizziness and nausea, but besides that it was an excellent experience. I don’t have time to play it right now,but I have my ginger pills ready for when I pick it up again. I hadn’t heard this! I’ll have to try it the next time I venture into Egypt. I’m sorry the camera movements don’t agree with you. I’ve been lucky – no first person, so I’m okay! haha. If you pick it up again, I’d be interested in hearing your thoughts. Oh I definitely intend to! I was once a HUGE fan of the Assassin’s Creed series (love the badass hoods, haha), but have fallen off the bandwagon. I own Syndicate and Origins and seriously need to play them soon. I was obsessed with ancient Egypt as a kid so I’m very much looking forward to learning this stuff in Origins. The whole series has actually taught me a lot about history! Not sure if this counts as a tangent learning experience, but Super Mario World 2: Yoshi’s Island motivated little me to learn how to read. I really wanted to know what Kamek was saying before boss fights happened, haha.